I won't be around but be sure to hit up the local comics shops for Free Comic Book Day! 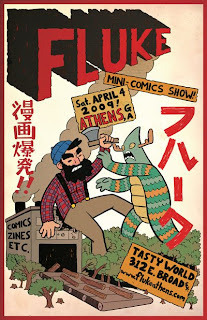 Kingdom Comics in Vestavia always is great for throwing down on FCBD and I've heard that AstroBrain in Pelham may have local artists (give 'em a yell if you want to participate) and stuff. Oh, and FREE COMICS!!! So, if you're up to driving to Greensboro, a great time will be had! 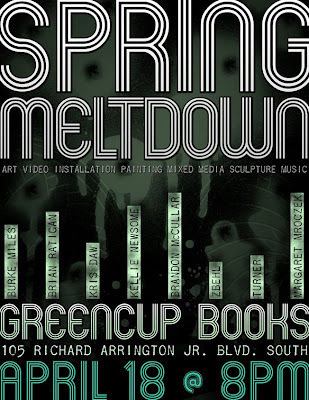 This Saturday Night (4/18) @ 8pm you are all invited to the Spring Meltdown Art Show at Greencup Books. There will be animated video projection by Burke Miles, Kris Daw, and yours truly, as well as sculpture, painting, and live music. 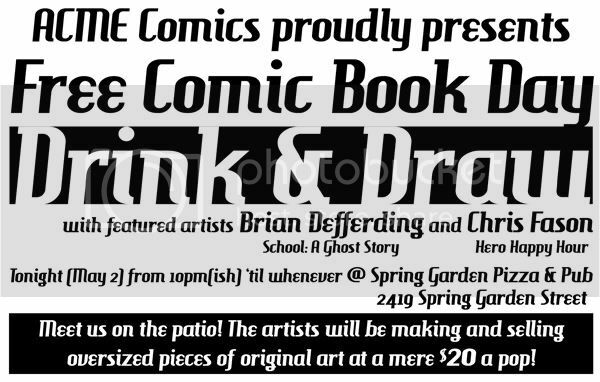 BYOB, or there will be beer for donation (give what you can, as it's a nonprofit bookshop). Witness the spectacle! Bask in the glow of inspiration! Berate your nonattendance friends! Come out & support your friends. Hope to see you there. SHC Chris Rosko has a hand in making some of the Flying McDavid Bros. cartoons, as well. Friday - I missed most of Friday because I decided not to take time off of work. I arrived a bit after 5:00 and set up shop at Kingdom Comics' booth. I did a couple character drawings just to see if anyone would bite. Knowing that Friday wouldn't be a giant sales day, I wandered the con checking out the dealers and looking for friends. I found The Wandering Men [http://www.wanderingmen.com/], who are friends of mine, and sat in in on a "Developing Your Art Style" panel that one of The Wandering men, Brannon Hall was on along with Billy Tackett [http://www.billytackett.com/], Bryan King [http://www.neo-earth.com/], James Hill [http://www.darkdaysartist.deviantart.com/], and Nigel Sade [http://www.nigelsade.com/]. It wasn't a heavily attended panel (a Friday thing) but it was fun to watch and interact with these guys. Sunday - I didn't STOP drawing all day. I even had to skip a contest I was considering entering in lieu of the list of commissions I had lined up. A very good day. And the raffle was fun too. I should have made a big deal out of it and a fool out of myself and had more fun with it but I was soooo tired by then. Anyways, overall, I had an excellent time of myself and met lots of great people and maybe even made a few new fans of my work. Mucho props and thanks to the organizers, staff, volunteers, and sponsors who made this a very fun and exhausting (in a good way) event. Rawk. The premiere of my new show FINAL BROADCAST is tonight at 6pm on BrightHouse Networks Channel 04. This half-hour block features electronic music by The Electric Kidneys and the animation of Kris Daw, Jeremy Pate, and yours truly. If you don't get BrightHouse, we will have videos online soon. Tell your friends and support independent animation! FINAL BROADCAST :: EVERY Friday at 6pm on BrightHouse Networks Channel 04. THANKS FOR READING AND TAKE CARE! OF YOURSELVES.